It might be hard, at first, to get past the vegan aspect of Ramen Hood. Aren't fatty slices of pork and thick tonkotsu broth why most people crave ramen anyway? 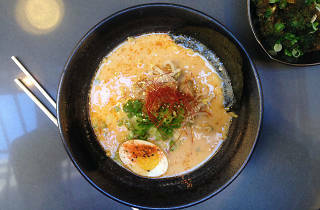 But Ramen Hood, which sits near the southeast corner of Grand Central Market, doesn't serve watery, flavorless bowls. Instead, you can choose from either plain or spicy ramen, both boasting a thick, sunflower seed broth filled with king oyster mushrooms, nori, scallions, bean sprouts and hearty noodles. A vegan egg, made from soy milk and nutritional yeast, can be added for $2—and while it doesn't taste exactly like an egg, it's pretty close. There are a few sides available as well, like crispy broccoli sitting in a pool of soy chili glaze, and tofu al pastor. But the ramen is the star, and well worth a try even if you're all about that fatty pork belly. Honestly, I don't think any kind of ramen can compete with the normal Tonkotsu broth with pork belly I usually get at Jinya. 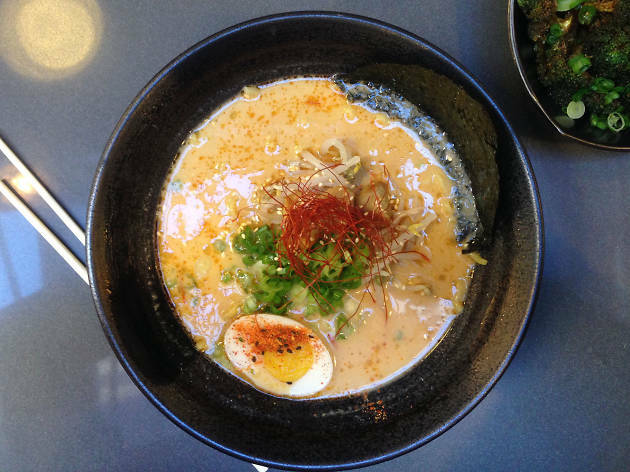 But Ramen Hood is an interesting and tasty vegan take on your usual ramen dishes. It definitely lacks flavor in certain areas that I feel like you get with meat based ramen, but overall the broth was still flavorful and the mushrooms in my bowl were fantastic. If you're at Grand Central and craving something salty and filling or a vegan looking for a ramen fix, I suppose this spot is worth trying sometime. This place is so unexpectedly delicious! I used to go for veggie ramen at my usual pork belly spots when I was feeling like a meatless option, but never again. I can't believe this is vegan—the broth is so rich, the mushrooms more than make up for any lack of meat, and the noodles are chewy and satisfying. I crave this soup more than I crave tonkotsu now! I certainly did not expect to like Ramen Hood—I'm a "give me all the pork belly" person—but the vegan ramen at this Grand Central Market stall is up there with some of the best ramen in LA. The sunflower broth is not watery at all, but instead creamy, rich and entirely satisfying, and the noodles used are chewy and fantastic. The only thing that weirds me out a little is the rubbery vegan egg. There are some things you should just leave alone.